Zodiac signs guide us through almost everything in life be it about as routine as work or as complicated as choosing the right financial strategy. Similarly, selecting a Budget Halloween costume is nothing less than a pickle. It can be really challenging. For starters, you don’t want to look like anyone else, and at the same time you want to look the best. Basically, you want to ensure your Halloween costume fits your literally and metaphorically. For that, you need an outfit that is fashioned to make you feel like the unique and wonderful individual that you really are. Now coming back to the horoscope, "zodiac signs reflect on the true fantasies and hidden emotions of an individual". Halloween costumes are probably the most creative and exciting way to bring these thoughts of fancy on to the surface. 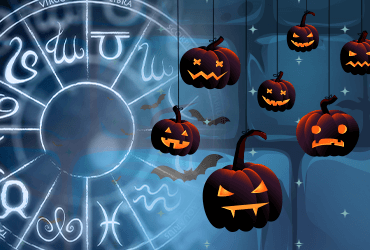 So here’s a list of some Halloween costume ideas that perfectly express the true colors of your personality based of course, on your zodiac sign. Aries: Interestingly, unlike Rams(zodiac symbol) who keep their heads down and quietly follow the flock, you people are fiercely independent. You love to create your own identity. With a crazy temper, comes your warm and compassionate heart just like a superhero. So what other costumes than that of a guardian that suits your paladin-like personality. Wonder woman, Superman, Spiderman, etc. would work well for you. Taurus: The bulls are known for their tough exterior and stubbornness. They are very hard working and just unimaginably practical. But not many know they have an extremely romantic side to their personality which makes them fall for fine little details in life. They belong to the pride of royalties! Therefore, a regal costume like a king or a queen would suit you the best. How about Eddard Stark or Luke Skywalker. Gemini: Geminis are funny, they can just crack one up anytime they want. Clever and mysterious, the Gemini ascendants are very persuasive. They can trick you into anything without you even knowing it. But the best part is that they are twins much like their sign, so you can dress as characters that represent contrasting yet deeply connected personalities like Hulk/Banner, Clark Kent/Superman. Cancer: Cancerians are very emotional and warm. They are people we can categorize as grown-ups. Plus they are fond of eating and apparently, most Cancers have a sweet tooth as well so the best fit for them would be someone like Dumbledore or Gandalf or our favorite Marge from the Simpsons. Leo: Everybody knows Leos are loud and domineering. They would do anything, go to any lengths, to be in the spotlight. They are probably the strongest and the most sparkling ascendants and wish to emulate their zodiac sign, the Lion. They would look best dressed like someone who has been the darling of the crowds everywhere he/she goes, and frankly, while there are many such artists and actors who were loved by millions, no one came close to Elvis, Madonna, and Michael Jackson. So you know who you need to dress like this year if you are a Leo. Virgo: The nerdy Virgos are intelligent, sensible, and really smart. You can’t fool them. Plus, they are sort of perfectionists as well who want everything in the right place at the right time. A set of characters that come to mind who can actually portray your intellectual bent are Hermione Granger, Cat Woman, the Iron Man, and Dorothy from the popular musical, Wizard Of Oz. Libra: Librans like to keep it easy and simple. They believe in enjoying life to fullest, and for that, they have devised a personality. It can be characterized by an individual who is highly social, very romantic, and ultra modern. Something along the lines of female protagonists from popular rom-coms. Renee in Bridget Jones Diary, April from Definitely Maybe, or literally any Cameron Diaz’s character. Scorpio: The signs of the Halloween, Scorpions are very dynamic, jubilant, and vivacious. They are basically the spirit of the Halloween so any spooky character would suit them just perfectly. Sagittarius: Sagittarius live on the edge! They are adventurous, unpredictable, and are endowed with great academic strengths. Since nothing can bog them down, characters who represent similar qualities would suit them the best. Jennifer Lawrence’s portrayal of Katniss Everdeen in the movie adaptation of the Hunger Games trilogy would be an excellent costume choice. Capricorn: Capricorns are known to be unwavering, brave, and ambitious individuals who would even walk an extra mile if it’s about achieving something really big. They are driven by passion and would do anything to achieve their target. A character that comes closest to this formal character description is Donald Trump. So you can go in as him and be the head turner. Pisces: You are water babies, ruled by Neptune, the king of the seven seas. Choosing a Halloween costume should be a no-brainer for you as anything related to water would suit you just fine. So amongst countless fictional characters that rule the oceans, Aquaman is the one who is trending at the moment. It would be a great costume option or if you want something cliche yet evergreen, then you can also consider Jack Sparrow who never gets old. Hope we have helped you finalize the costume for this year’s Halloween party. There is nothing as easy and exciting as dressing up on the basis of your Zodiac sign!